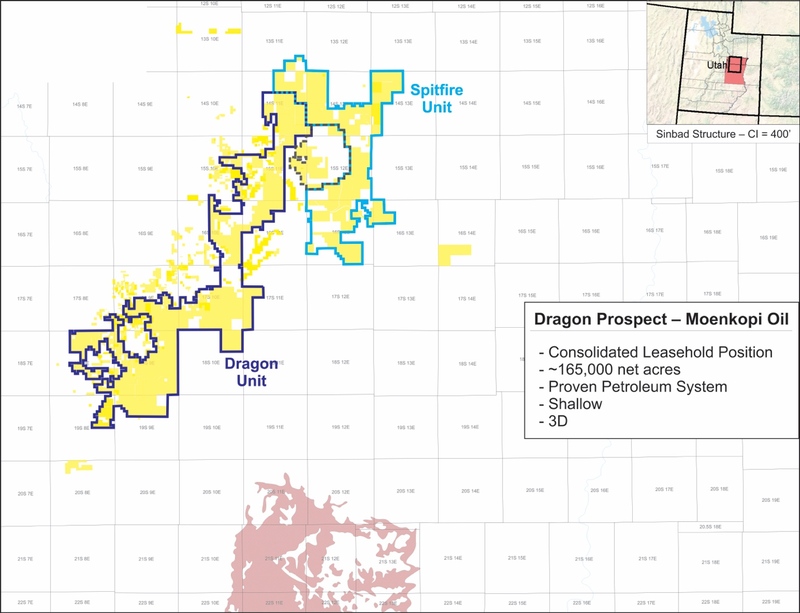 Black Dragon has the right to acquire a 75% working interest in and to certain leases, hydrocarbons, wells, agreements, equipment, surface rights agreements and assignable permits totaling approximately 165,000 acres (258 sections) at an 80% net revenue interest located in the Moenkopi formation of the Carbon and Emery Counties, Utah. Black Dragon Energy a wholly-owned subsidiary of Fortem Resources, has the right to acquire a 75% working interest in and to certain leases, hydrocarbons, wells, agreements, equipment, surface rights and assignable permits totaling approximately 165,000 acres (258 sections) at an 80% net revenue interest located in the Moenkopi formation of the Carbon and Emery Counties, Utah. The Moenkopi oil resource play adjoins Grassy Trails field, which has produced a cumulative 731,000 barrels of oil from the Moenkopi formation. Black Dragon’s Moenkopi property comes with new production facilities and is currently producing high gravity oil (38+ API) from a single well awaiting a cleanout to enhance its current production. High quality 16 square mile 3D seismic has been performed on the property along with significant progress on drilling permits of 12 wells. Currently, there have been 543 penetrations in the Moenkopi formation from surrounding areas. In addition, Black Dragon’s prospect also has three other potential formation targets like the Kaibab, Doughnut and Manning Canyon. Within the Moenkopi there are four different pay zone formations called TXS, Sinbad, Torrey A and Torrey B. The TXS member trend is located over an estimated 33,920 acres. The Sinbad member is mapped as having net pay across an estimated 120,640 acres and both the Torrey A and B members are seen on the same lands. Deloitte prepared a preliminary NI 51-101 Reserve and Resource report to evaluate the Moenkopi Group within the Company lands in Utah. The focus was around the Wellington Flats 15-11-18E well totaling about 7 sections (4,480 acres) which was drilled in 2012 to a total depth of 9,500 feet (TVD 5,900 feet) nearby Grassy Trail Field. The Grassy Trail Field serves as an analog field to the Moenkopi. With future development, Black Dragon will perform further evaluations on additional lands.